Here’s a nice Valentine’s Day surprise from Land Rover to four friends in New Zealand who decided, regretfully, to say goodbye to their jointly-owned Series Land Rover. Thanks to our friend Greg from gadmachine for the tip! This trailer is difficult for me to watch. I don’t like to think that the toothpaste cap I threw away five years ago is now choking a poor South Pacific sea bird. But millions of tons of the plastic I, and everyone else on the planet, throw away end up in the ocean every year. The problem is that the very things that make plastic appealing to us, also make it a fiendishly good marine-life killer: its low cost ensures that it’s plentiful, and its relative durability means it sticks around. Plastic never biodegrades but instead breaks into smaller and smaller pieces when exposed to sunlight, thereby effecting animals further and further down the food chain. Even tiny zooplankton die by ingesting plastics. It’s crazy when you think about it. We take three-hundred-million-old oil out of the ground, make it into plastic, use it for a few minutes, or a week, or a year, and then put it out into the environment for 500–1,000 years. The film, Midway, by Chris Jordan, shows the effects of plastic trash on sea birds at Midway Island. It comes out this year. Something else that we’re listening to: The Naked and Famous… from New Zealand. This is a live version of their song “Young Blood,” from the album Passive Me • Aggressive You. It’s times like this that you really want to trust your snorkel install and waterproofing job. This video is from New South Wales, Australia via YouTube. Once your windshield wipers are under water, you know you’re in deep. This month marked the 75th anniversary of the of the disappearance of Amelia Earhart, her navigator Fred Noonan, and the Lockheed Electra they were attempting to fly around the world. It was July 2nd, 1937 and Earhart and Noonan were in Lae, New Guinea, having spent the previous month flying eastwardly across Africa, India, and Southeast Asia. Oakland, California, their starting point, lay only an ocean away. 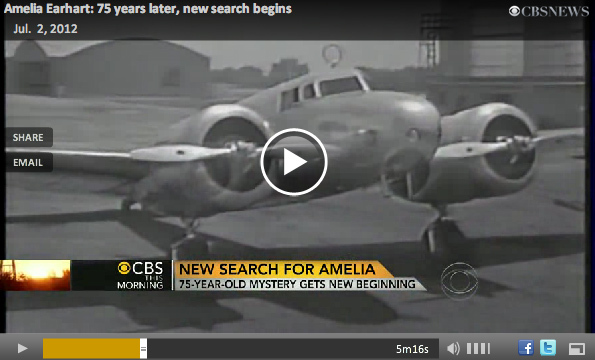 Tags Amelia Earhart, finding Amelia Earhart, found, Gardner Island, Howland Island, lost, mystery, Nikumaroro Island, radio, search for Amelia Earhart, shortwave, solved, transmissions, video, WCXC, What happened to Amelia Earhart? I recently came across this amazing, downhill mountain bike footage from a Canadian production company called Anthill Films. 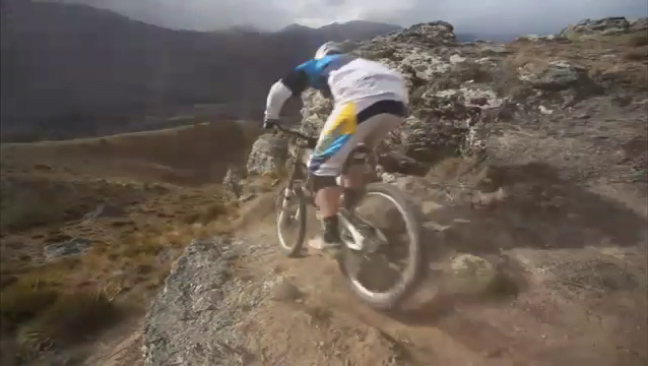 This particular shot, called Stevie And Gee’s Downhill Run, from the company’s film Follow Me, was shot near Queenstown, New Zealand. It’s four minutes of beautifully edited deft-riding, dirt-flying gorgeousness and definitely worth a look. They’ll be releasing a new film this spring called Strength in Numbers.